It’s heating up in the domestic league… | Come Here To Me! « “Eccentrically dressed” and jitterbugging away: Dublin’s Teddy Boys in the 1950s. Last night was an absolutely huge night in Irish football terms, at both ends of the table. Saint Patrick’s Athletic managed to go three points clear of a seemingly unstoppable Dundalk, while at the other end, Bohs took a very vital three points from Shelbourne, in a game many saw as a northside relegation scrap between the two. There were massive travelling supports in both Inchicore and Tolka Park, and these two images below capture the colour and the passion of the night differently. In Inchicore, both sets of supporters lit up Emmet Road, with Dundalk squeezed into the shed behind the goal. 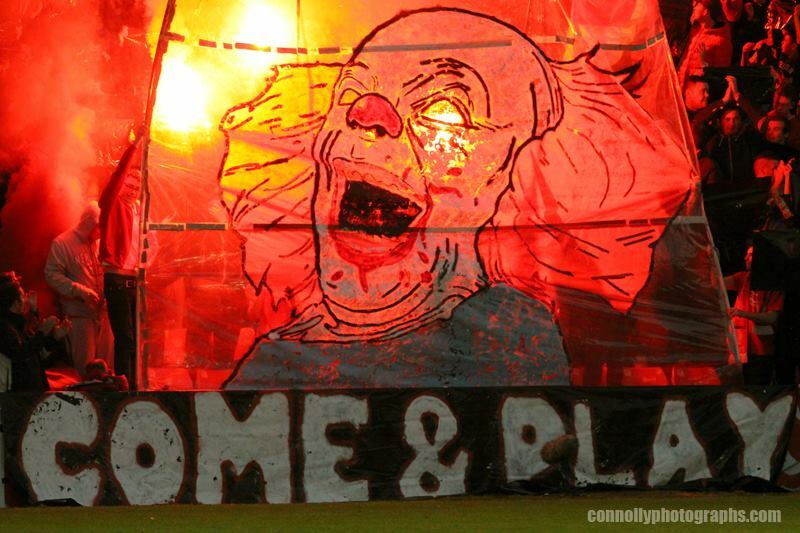 In a brilliant coincidence, the Dundalk banner featured Jigsaw from the film series ‘Saw’ asking Saint Patrick’s if they “want to play a game”. The Patrick’s banner invited Dundalk to “come and play”. The game was at times lacklustre but at other times thrilling, regardless however I think the colour and noise made it a good one for the television cameras. 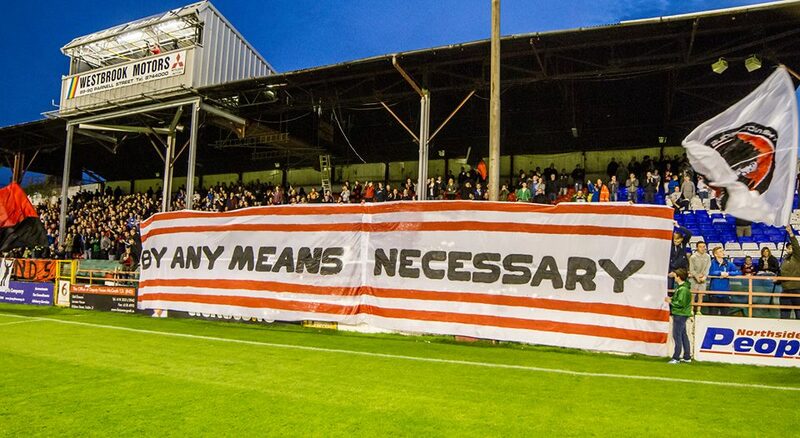 At Tolka Park, Bohs captured the importance of the clash with a banner on the importance of remaining in the top tier ‘by any means neccessary’. Bohs supporters at Tolka Park. IMAGE: Paul Reynolds. While Giovanni Trapattoni stating that Ireland had no football league may have been a case of something getting lost in translation,and was deeply ironic giving the fact so many of his own starting eleven have played in the domestic league, the next five weeks will see some brilliant battles at both ends of the table, in a league which deserves the support of Irish people. My eleven year old was in bed sick and full of anti-biotics all week. Wednesday night he was running a temperature of 40. Been sleeping on the floor beside him each night. Got one text from him on Thursday, ten past four. It read ‘Dundalk are bringing 1200 tomorrow.’ There’s not much wrong with a league that does that for a kid, and his dad. We ended up in Tolka as the older lad is Bohs and the other fella wasn’t going to pick up his bed and walk anytime soon. Cracking night down there too with the phone hopping all night as the good news came through from the Camac. Interesting article in the Shels programme that picked up on Richard Sadlier’s piece in the Sunday Indo – as did the Pat’s programme a week or two ago. They’re all asking where to from here? Well a bit of positive coverage in the papers would be a start. The week that Sadlier had his article (a third of the broadsheet page) was the week that Bohs and Rovers had played their outstanding game on the Friday and not a mention of it. If they can sell the rubbish that was Chelsea v Man U and Man U v Liverpool as being entertainment (I support Liverpool too) then it should be possible to promote the genuine entertainment that’s to be had round here if a few journalists could shed their prejudices instead of feeding everyone elses’. The response in the Pat’s programme was the night of the Bohs game and the covered section of the terrace was inaccessible that night even though there was rain b;owing in. Clubs have to take a bit mpre responsibility and not be shooting thtemslves in the foot like that.